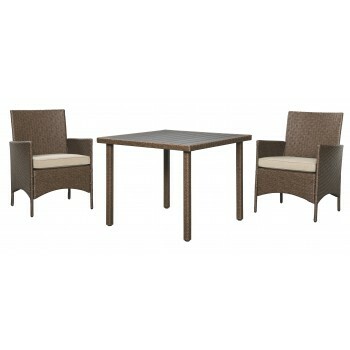 Mastering the art of outdoor living, this 3-piece dining table set proves that three’s not a crowd. The striking ensemble sports handwoven wicker over rust-proof aluminum to ensure seasons of satisfaction. Chairs’ cushy cushions are wrapped in high-performing Nuvella® fabric for easy care and pleasing comfort.